The Okavango Delta and Moremi Game Reserve - This is the best known tourist destination in Botswana and one of the last remaining wild places left on earth. The 5,400 sq mi delta, a mosaic of channels, lagoons, dry and inundated floodplains, papyrus reed beds, and palm covered islands has been declared a World Heritage Site and the largest Ramsar designated wetlands. It is the world's largest and wildest inland delta, formed by the Okavango River that has its source over 800 miles away. The Okavango Delta is a favorite destination of travelers wanting pristine wilderness and a variety of experiences, depending on the location and camp/lodge chosen. These experiences include 4x4 game drives, motor-boat rides, trips in mekoro (a dugout canoe), fishing, walking, elephant-back riding, and bird watching. Most camps and lodges in the delta are reached by light charter fights; those on the periphery are accessed either by plane or vehicle. Mobile and self drive safaris typically enter the delta from the southeast and visit Moremi Game Reserve. In Botswana, game reserves and national parks are essentially the same, the difference is that the land is either owned by a "tribe" in the case of a game reserve or the central government in the case of a national park. Both are regulated and managed by the Botswana Department of Wildlife and National Parks (DWNP). Moremi deserves its reputation as the finest game viewing park in Africa. We always enjoyed game drives here. We once pulled up to Third Bridge, an interesting bridge made of logs, to find that a game viewing vehicle had broken through the logs. We winched it out then we carried fresh logs from the pile left there by DWNP to fill in the gaps, all the while keeping our eyes out for crocs. 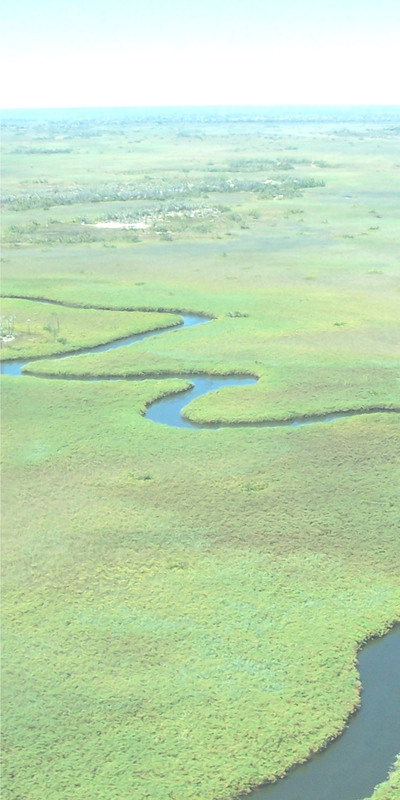 The Okavango Delta is fed by the annual floodwaters out of Angola Highlands. The flood arrives in the northern panhandle section of the delta around November (peaking in February or March), reaches the central part around April/May (peaking in June/July) and arrives, with much celebration, in Maun around July. With more than 95% of the Okavango's water evaporating before it reaches the town of Maun, you can understand why they celebrate! The delta supports, amongst other animals, the big cats (lion, leopard, and cheetah), spotted hyena, a large variety of antelopes (red lechwe, sitatunga, waterbuck, and numerous impala), zebra, giraffe, buffalo, warthog, hippo, wild dog, crocodile and elephant. In addition there is incredible bird life with over 500 species recorded in the delta. Makgadikgadi Pans National Park - This (1800 sq mi) park is a vast area of open plains and scrub country in the northern part of the Kalahari sand basin. From shortly after the first rains (Nov/Dec) to May, large herds of game - springbok, zebra, and wildebeest - are scattered across gently rolling landscape. These attract lions and other large predators. Various animals seek refuge and shade in the many "tree islands" that dot the landscape. The park borders the Ntwetwe Salt Pan. The Pan is part of a series of Pans known collectively as the Makgadikgadi Pans. They are the remnants of a huge lake that covered a large part of northern Botswana thousands of years ago. Now they are mostly dry, but fill up during the rainy season, thereby attracting great numbers of aquatic bird species. However, before the rains come, from August to October, the dry riverbed of the Boteti River teems with thousands of zebra and wildebeest who come to several of the small waterholes provided by the DWNP. We visited several times during September and these visits still stand out as some of our best trips. The water also attracts plenty of elephants and the zebra and wildebeests which attracts lions. On most nights, visitors will fall asleep (if they can) to the roars of hunting lions. See Notes from the bush for Cecilia's re-telling of one of our experiences with lions in Makgadikgadi NP. The Government campsites in the park are simple and there are several lodges to choose from along the park boundary. Several lodges offer quad bike tours out onto the pans. 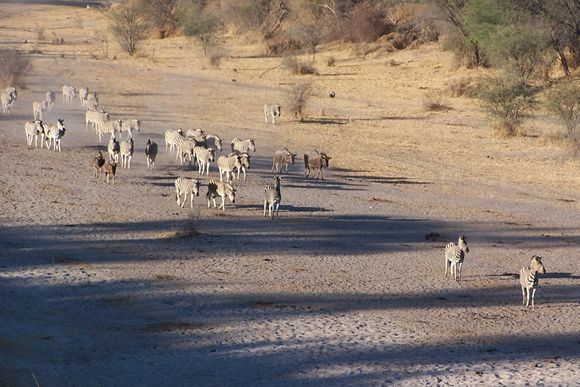 Nxai Pan National Park - This park covers 900 sq mi immediately north of and adjacent to Makgadikgadi Pans N.P. and can provide great game viewing at certain times of the year, especially after good rains during the period of December to early April. Then you may see herds of springbok, impala, zebra, wildebeest, gemsbok, eland, giraffes, elephants and their attendant predators, lions, leopards, cheetahs and wild dogs. The charming bat-eared foxes are a fairly common feature of Nxai Pan. In the dry season the game disperses, though there are always hangers-on because during this time the DWNP pumps water into a waterhole. A pride of lion resides near the waterhole waiting to ambush game that comes to drink. There is a good chance of seeing a lion kill here in the morning; you just need to wait patiently by the waterhole. This is the location of our friend Tim Liversedge's Imax film, "Roar of the Kalahari". This awesome film follows the life of the pride that occupies the water hole. We had the privilege of going to the Botswana premier of the movie at Gaborone's Grand Palm Hotel. The premiere was also attended by President Mogae, Vice President Khama, and a number of Cabinet Ministers. We were able to with Tim and June good luck as they prepared to leave for the USA to attend one of the many award shows "Roar" was nominated for. Chobe National Park and Kasane - This northernmost park covers nearly 4,000 sq mi and along with Kasane, the small town that serves as the Northern tourism hub. Chobe is considered an outstanding destination for game viewing, especially along the River in the drier months of the year, though big game can be seen at any time of the year. Chobe is home to Africa's largest gathering of elephants. The area is famous, too, for its prides of lions, herds of Cape buffalo, hippos, crocodiles, giraffes, varied antelope species and for supporting the country's richest bird life. Chobe is the only place in southern Africa where the Puku antelope occurs is along the northern stretches of the Chobe River. Game drives are highly productive and a boat trip, especially in the late afternoon, is a must. There is no better game viewing by boat anywhere in the world than along the Chobe River in the dry season. The Central Kalahari Game Reserve (CKGR) - This 18 775 sq mi game reserve is the largest in Africa and nearly six times the size of Yellowstone National Park. The reserve has expanses of open grasslands and Kalahari scrub. There is no permanent water but is still home to many animals including lion, leopard, cheetah, wild dog, the shy Brown Hyena, and other desert specialists like Bat-eared fox, gemsbok, red hartebeest, springbok, and ostrich. The CKGR is crossed by fossil river beds, and covered with endless Kalahari scrub and grassland, and stands of acacia trees. The snapping sound of barking geckos mingling with the eerie, plaintive yelps of jackal during the night will lull you to sleep under the most incredible set of stars you will ever see. We can arrange lodge-based and camping trips to this destination. The Makgadikgadi Salt Pans - These two huge salt pans Ntwetwe and Sowa are the largest in the world. While there is not a lot of game to the east around Sowa there are tens of thousands of greater and lesser flamingos that breed in the shallow waters in the early part of the year. Many of these birds can be seen at the non-profit Nata Bird Sanctuary, at the northern end of Sowa Pan. 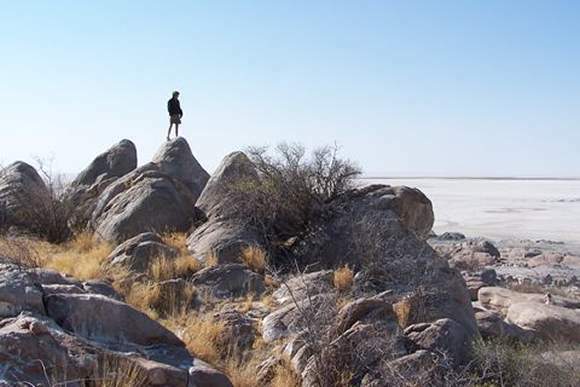 Also located on Sowa Pan is one of our favorite places in Botswana, the incredibly beautiful Lekubu Island. This rocky outcropping is home to hundreds of Baobab trees and is considered a very spiritual place by the Batswana. We camped there for several days during the full moon. From the top of the island, you can watch the sun set out across Ntwetwe Pan and at the same time, as you turn to look behind you, you can see the moon rising over Sowa Pan. If you get there, be sure to explore the eastern end of the island, along the southern face of the rocks. There is a small cave where visitors leave offerings to the gods. The camp sites are nicely laid out and managed by the Gaing-O Community Trust. We can arrange for mobile camping trips to this destination. Kalahari National Park - This international park has recently been created by the joining of two sanctuaries, the Kalahari Gemsbok National Park in South Africa and Botswana's Gemsbok National Park. The two parks are now run as one entity. The Botswana side, utterly remote, larger and less developed, covers an area of 10 225 sq mi. This very dry area is notable for its red Kalahari sand dunes, seasonal grasses and thornveld. In this immense wilderness, relatively seldom visited, the best game viewing is probably between January and April when you can expect to see, amongst other animals, desert-adapted antelopes (gemsbok, springbok and eland), lion, cheetah and jackal, and, with luck, in the evening or early morning, brown hyena, bat-eared fox and leopard. To the immediate north of the park is CHA (Controlled Hunting Area) KD1. The area is managed by the Nqwaa Khobee Xeya Trust. KD1 is 4,300 sq mi (that's the size of Pennsylvania!) with a population of 800 people. 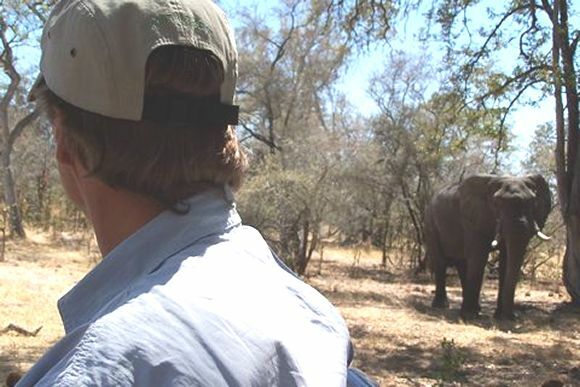 Peter was the Trust's advisor helping with developing more tourism activities and with their tendering of their hunting quota to safari outfitters. This is an area that receives less then 50 outside visitors a year and is some of the last remaining wilderness not set aside in national parks. Kafue National Park, Zambia - Kafue is the oldest and largest park in Zambia and covers over 8,000 sq mi (twice the size of Yellowstone National Park) which makes it the second largest national park in the world. The park is known for its great diversity of wildlife. It has lion, elephant, hippo, leopard, cheetah, wild dog, sable and roan antelope, defassa waterbuck, sitatunga, reedbuck, puku, kudu, red lechwe, impala, oribi, and there are herds of tsessebe, Lichtenstein's hartebeest, zebra and buffalo. Bushpig and warthog inhabit the vast plains and woodlands, with yellow-backed duiker, common duiker, grysbok, serval, hyena, jackal, baboon, vervet monkey, porcupine, crocodile, civet, genet and many species of mongoose. The birding is also exceptional with over 400 species seen. In the south of the park, where we offer trips to the new Nanzhila Plains Safari Camp, are dense double canopy forests, tall mopane woodland and Kalahari sandveld. The Nanzhila Plains are dotted with baobab trees and euphorbias. The camp specializes in walking safaris where guests get close to nature. The area around the lodge has a number of micro-environments that offer a tremendous variety of plants and wildlife. For more information about Cecilia's project to help remote area dwellers and women in Botswana!